Are you ready to join the ranks of the most elite wizards, still unknown to the majority of muggles? Then we've got the perfect costume for you this Halloween. 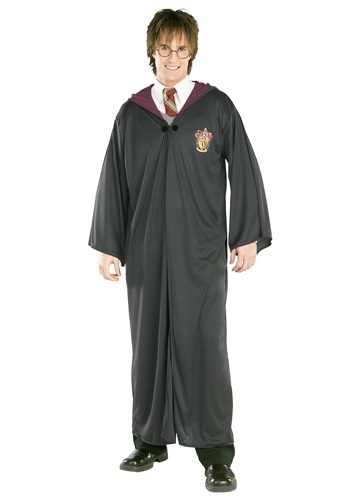 Grab this Harry Potter Costume and you won’t care that the muggles don’t know about your amazing story. You’ll be too busy getting praised by the rest of the magical community! Transform into one of the most iconic characters in both literature and cinema, the beloved Harry Potter! Once you toss on this robe you will be well on your way to being the most powerful wizard that Hogwarts has ever produced. This awesome robe is black and maroon, and has the Gryffindor logo on it just like Harry’s did throughout all the films in the acclaimed series. Besides this costume, you will need to get your hands on a few accessories. Look through our collection of wands and find the one that’s been waiting for you for your entire life. Maybe even grab a broomstick to fly around on and in case anyone has the nerve to challenge you to a game of Quidditch. Mr. Potter is known as one of the greatest Keepers in the history of the sport so you’ll have a lot to live up too, no pressure! The last thing you’ll need to complete this awesome costume is a scar. Not just any scar, but one exactly like Harry’s. Instead of attempting to damage your forehead, don’t, and grab one of our makeup kits. You’ll be able to paint on a fake scar without a problem. You just need a steady hand and a mirror… or a good friend!